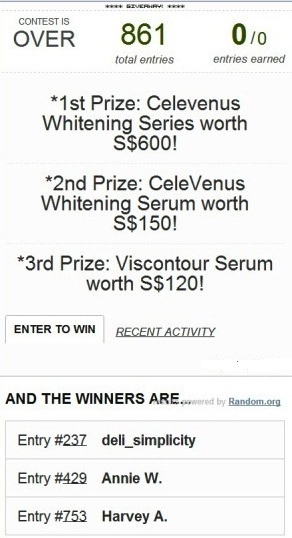 You are here:Home » Contests / Giveaways » Winners Of CeleVenus Whitening Series & Viscontour Serum Giveaway! 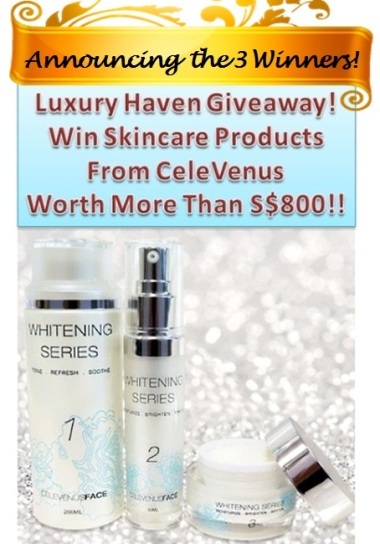 Please acknowledge this post with a comment below within 48 hrs or another winner will be selected. After which, I'll be following up with an email for your collection details. Amelia, thks for your wonderful comments! Hi Shirley Thanks for the giveaway!!! Hi Shirley! I'm so happy that I can won this 2nd prize. Thks for the giveaway. DS, thks again for your relentless support!